Attorney Michael Coard, a Cheyney University alumnus, is among the leaders of the group seeking funding equity and parity for the HBCU. 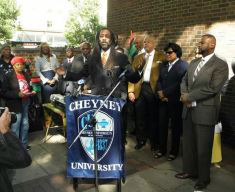 A broad-based coalition of Cheyney University supporters plan to file a federal lawsuit today claiming a history of racial discrimination from the Commonwealth of Pennsylvania toward the nation’s oldest Black institution of higher learning. After nearly a year of negotiations, talks stalled during the summer, according to attorney Michael Coard, a Cheyney alumnus who is among the leaders of the group seeking equity and parity for the HBCU. Cheyney now barely has 1,000 students and is facing mounting budget deficit ― projected to grow to $21 million by next year. The Coalition, which is named “Heeding Cheyney’s Call,” was formed in 2013 and is modeling its approach after Maryland’s successful litigation against the state for underfunding and neglect of its three HBCUs. The negotiation team includes Dr. Earl S. Richardson, former longtime president of Morgan State University and expert on discrimination in higher education; Attorney Pace J. McConkie, director of the Robert M. Bell Center for Civil Rights in Education; and Attorney Joe H. Tucker, head of the Tucker Law Group, one of the largest African-American law firms on the East Coast. The Coalition includes alumni, students, professors, staffers, retirees, civic and religious leaders, and elected officials. Of the 14 state institutions overseen by the State System of Higher Education, Cheyney is the only HBCU. Coard says Cheyney has been woefully underfunded and neglected. According to Coard, the Coalition will hold a press conference today on the steps of the James A. Byrne U.S. Courthouse in Philadelphia prior to filing the federal lawsuit. The lawsuit names Governor Tom Corbett and the Commonwealth of Pennsylvania, which Coard says are in violation of federal and state law, and a 1980 signed agreement. “We hope that the next step will be continued negotiations. We will continue to reach out to the current or new administration. Filing a lawsuit doesn’t slam the door, unless they slam it. If it is up to us, the negotiations will continue,” he said. The group is asking for funding to enhance existing academic programs, including adequate resources, improved facilities, state-of-the art equipment, effective recruiting and experienced marketing staff; reform of Pennsylvania State System of Higher Education policies; and implementation of judicial oversight to ensure compliance. Cheyney supporters filed a similar lawsuit 33 years ago. The resolution of that case, along with a 1999 agreement between the state and the U.S. Office for Civil Rights, was hoped to bring parity to the university’s funding and facilities problems, but did not. State officials who were not available for comment have previously pointed to a new dormitory and science center on the campus as evidence of support. According to Coard, they were the first improvements to the campus in nearly 30 years. The Cheyney’s Coalition members are hoping for an outcome similar to Maryland’s win last year when a federal district court judge ruled that the constitutional rights of students who attended the state’s three historically Black colleges and universities were violated. Bowie State University, Coppin State University and the University of Maryland Eastern Shore — the state’s Black colleges — filed a lawsuit against the State of Maryland in 2006 complaining that it aggressively supported “high demand programs” at White institutions while not doing enough to invest in specialized programs at the Black institutions. The Coalition is hoping to get Cheyney’s enrollment back up to 3,500 students and a budget that compensates for past neglect and will give the university the ability to generate tuition income.